Hafla to follow in the evening! Learn the secrets to making your dancing Middle Eastern as opposed to just doing Middle Eastern moves to music. Alia is a professional Belly Dancer who has worked all over the world, especially in Egypt, where she earned her Performer's License (which is the highest qualification you can earn in the Middle Eastern Dance world). While in Egypt (1996 - 1997) she had the unique experience of being the only foreign dancer to have performed for President Mubarak. Originally from New Zealand, she now lives in Australia. She has almost 30 years of dance and teaching experience and brings a wealth of information. 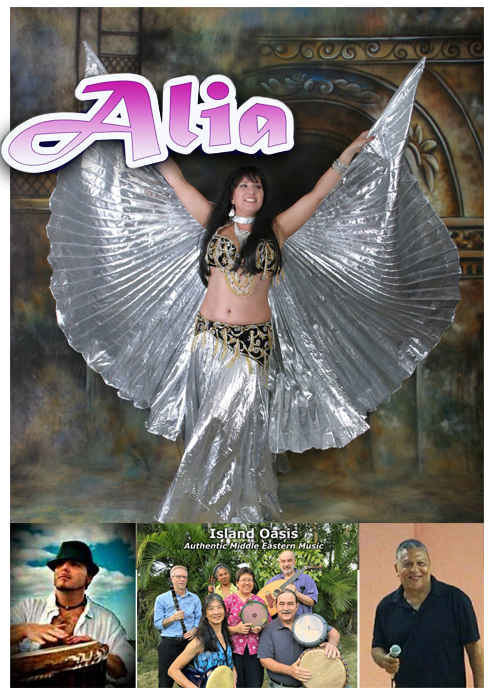 In Melbourne, Alia performs at restaurants, weddings and functions, both in the cabaret and folkloric styles. Live Middle Eastern band "Island Oasis"
An open dance floor for all to enjoy and dance! Come ready to dance! You can come in costume, or in your favorite belly dance wear! Tell your friends to get dressed and meet you on the dance floor! 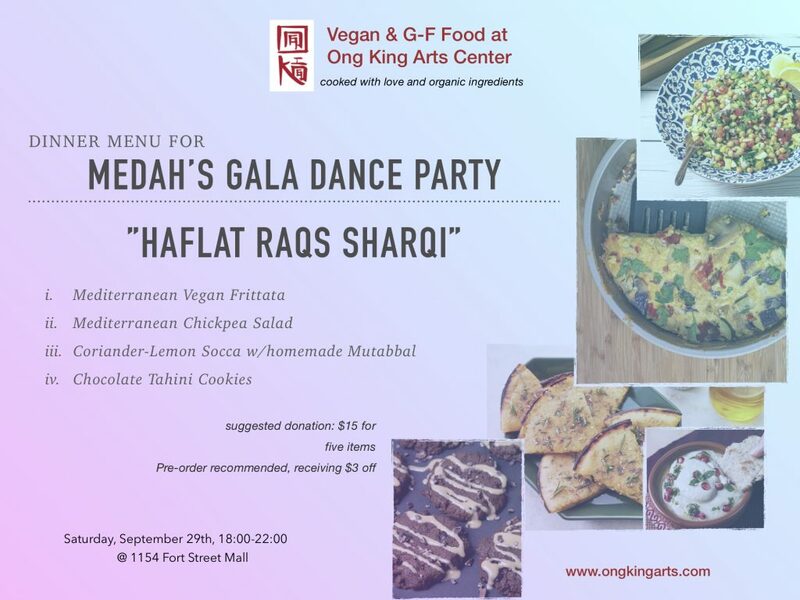 Add a delicious vegan and gluten-free meal prepared by Ong King! 'Hafla' is an Arabic word and has multiple meanings: party, celebration, and/or concert. Haflas are a wonderful opportunity to gather as a community to share joy and friendship by dancing and making music together .Haflas can be a time to perform with or for each other, but at their essence they are a chance to support each other and allow hobbyist, students, teachers and professionals alike to come together in non- competitive and supportive environment. What should you expect to see when you walk in to a hafla? Fellow enthusiast of dance and music--you found your people! A room full of music, color, sparkles and smiles. Dancers and musicians of all skill level out on the dance floor together. Perhaps a sneak peak of students with their teachers working on the latest combos from class. Familiar faces or friends you haven't met yet. Leave room for spontaneity: A chance to follow a dancer in a different style, practice a tricky musical rhythm with live music. Play your new drum, maybe sing Who knows--It's a party!! Do haflas have rules? Yes and no. At their very core they are meant to be social. Can anyone come join the dance floor at a hafla? YES, YES, YES! However, there may be times set aside for brief performances or activities. Wear what makes you feel fabulous you dancing Queen or King! If you are aching to show off a new hip scarf, pants, skirt, choli or all of the above or more, you absolutely should! You will be transferred to a secure website. All tickets include a nominal processing fee.